“Therapy dog” is a title most commonly held by canines of a certain size and stature. It evokes thoughts of breeds like terriers, spaniels, and the occasional retriever. But Chai, a 115 lb. Cane Corso, or Italian mastiff, is none of the above. 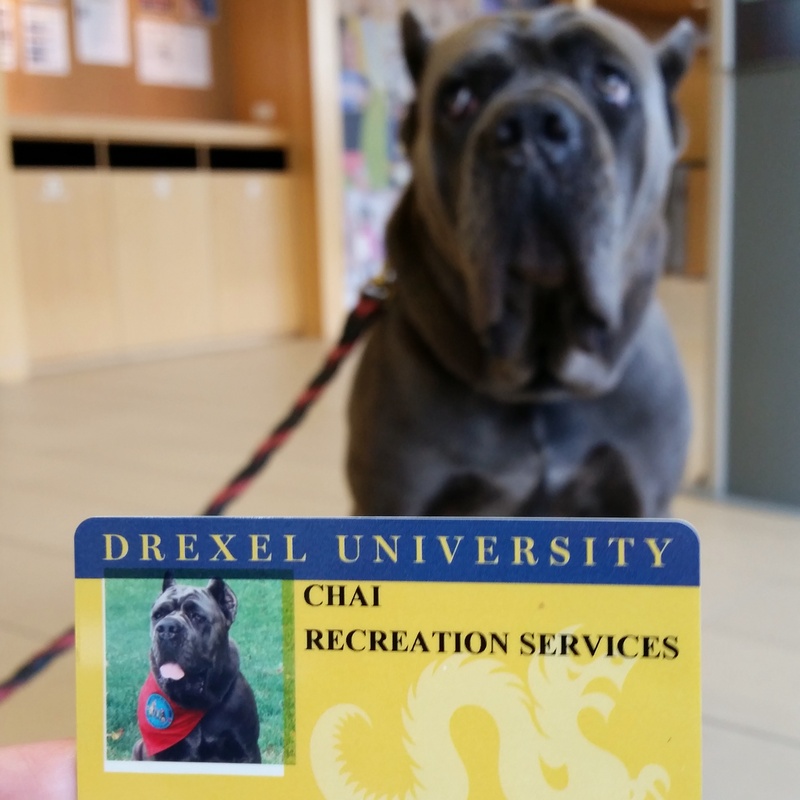 Chai is Drexel University’s new official therapy dog. The four-year-old gentle giant began working at the university at the beginning of summer and has since spent about ten hours per week on campus at various locations. Her owner, Janine Erato, said the student response to Chai has been incredible. Chai came to the university by way of some serious networking. Janine’s son, or Chai’s human brother, attends Drexel. He reached out to university faculty and recommended his dog—and volunteered his mother—for the recently vacated position of official Drexel therapy dog. The university’s first therapy dog, Jersey, left the position in January. 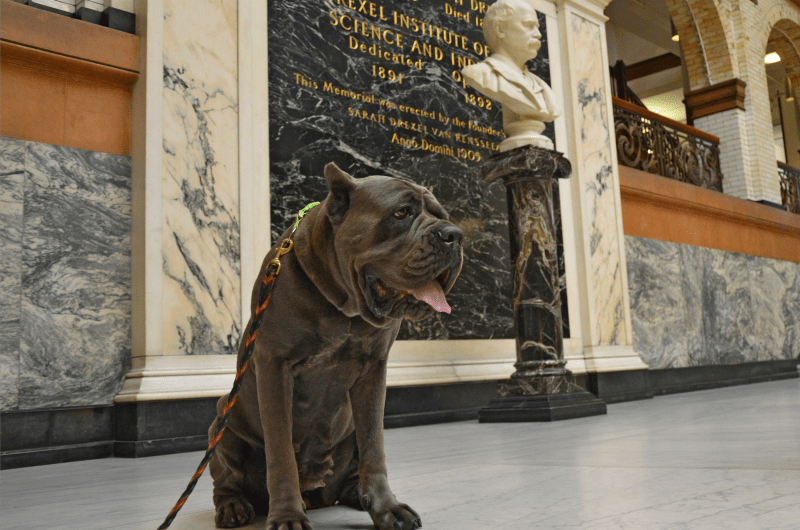 Replacing Drexel’s first therapy dog was a job with big shoes to fill. Thankfully, Chai has some very, very big feet. Not only that, but she has some help—her daughter! After breeding Chai two years ago, the Erato family kept one puppy of the litter of seven and named her Espresso. Espresso, or Essie for short, has since begun her own therapy dog training. True to her caffeinated name, Espresso is better suited for high-energy campus events, but Erato hopes to bring her to student therapy sessions soon. Chai was the family’s first therapy dog. Four years ago, Erato said that if her family was going to get a puppy, then they wanted the puppy to have a purpose. Erato, who works with special-needs children as her full-time job, decided that therapy dog would be the most appropriate role. It’s since proved a perfect match. Chai’s calm, gentle temperament and intelligence made training a breeze. “She’s always taken well to meeting strangers. She’s never been guarded, but she had a lot of socialization when she was little,” Erato said. In fact, in her training, she has earned more certification and titles than most Drexel professors. Her full-titled name includes THD, CGCA, CGCU, and TDIA certification. Of those is Canine Good Citizen Urban, a behavioral test for city environments like Drexel’s campus. Regardless of her titles, Chai wouldn’t make a very good professor. “She really likes to eat paper,” Erato warned. A paper-eating dog gives students motive to put down their homework and unwind for a few minutes. Erato said Chai has two major purposes at the university. But Erato understands that Chai’s presence may make some people uncomfortable. She said she takes extra measures to make sure everyone feels safe. “Drexel’s gotten a few concerned calls about a ‘big dog walking around campus.’ They have to explain who Chai is and why she’s there,” Erato said. “When I see someone who looks apprehensive about Chai, I don’t just tell them ‘She’s friendly.’ Instead, I tell them while I actively move Chai away, as if to say ‘She’s friendly, but I’m going to move her away so you feel comfortable,’” Erato said. In their therapy dog training, she said they never met another Cane Corso. Aside from Chai’s intimidating appearance, they’ve only ever faced one problem as a result of her breed—everyone thinks she’s a boy. As a working dog, Chai has had numerous exercises and training. Erato said Chai’s favorite thing to do is weight pulling—she can pull 800 lbs. on a wheeled cart! However, while her temperament as a therapy dog and mastiff have helped some tasks, they have hindered others. She may not be able to herd sheep, but Chai is certainly good at her job—helping others, particularly, stressed Drexel students like yours truly. Follow Chai and Espresso’s activity through their Facebook group for updates on visiting hours and locations.